The #TakeDownJulienBlanc campaign got IRL in a big way. 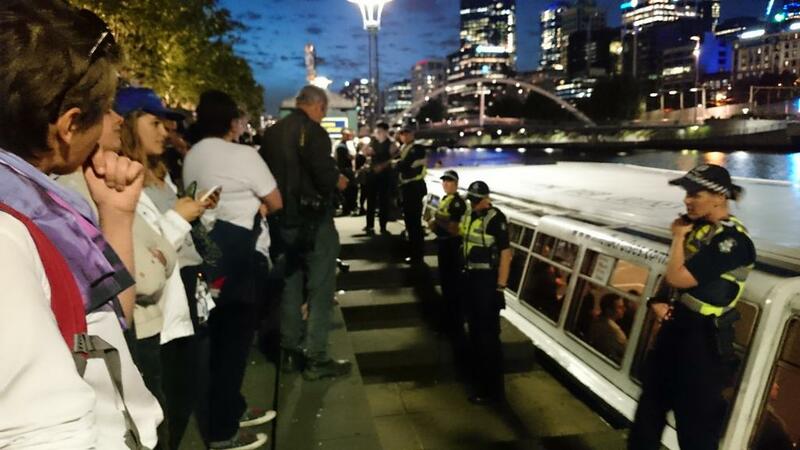 A notorious pick-up-artist seminar that encourages the harassment of women was picketed by protesters in Melbourne on Thursday, culminating with the group behind the seminar being kicked off the boat where the event was held. The pick-up artist Julien Blanc arrived in Australia last week for a series of public seminars teaching manipulative and degrading techniques under the model marketed by the group, Real Social Dynamics. The online campaign #TakeDownJulienBlanc quickly gathered steam and several hotels and businesses cancelled bookings, forcing Blanc to stage alternate events. On Thursday night, Blanc did not show at an event on a boat on the Yarra River and instead sent another Real Social Dynamics employee, "Maximilian", to hold the seminar. Video posted by Support Rsd shows tense confrontations on the water's edge before the seminar. One woman appears to slap Maximilian. BuzzFeed News understands the woman was responding to a situation that was not filmed in which she was pushed and shoved. Journalist Asher Wolf told BuzzFeed News the men eventually got on to the boat as protesters chanted and tried to board the vessel. "It was intense and surreal," Wolf said. Police arrived and kept protestors from boarding the vessel. Despite criticism that the officers were protecting men who advocate abuse towards women, "the police did their job," Wolf said. Eventually the boat operators and police came to an agreement to get the group off the boat, and they streamed past the protesters. Herald Sun journalist Tom Minear spoke to Maximilian, who said it was "sad" the seminar had been shut down. There was an explosion of praise online, where the #TakeDownJulienBlanc campaign had started. i don&#x2019;t need femisns why do you want to #TakeDownJulienBlanc when you could go OUT with him? He&#x2019;s an EXPERT! at choking &#x26; mistreating women. i don t need femisns why do you want to #TakeDownJulienBlanc when you could go OUT with him? He s an EXPERT! at choking & mistreating women. Damn fine job by all those in the streets and on the banks to #takedownjulienblanc. If I was Bob Hawke, you&#x27;d all have tomorrow off work. 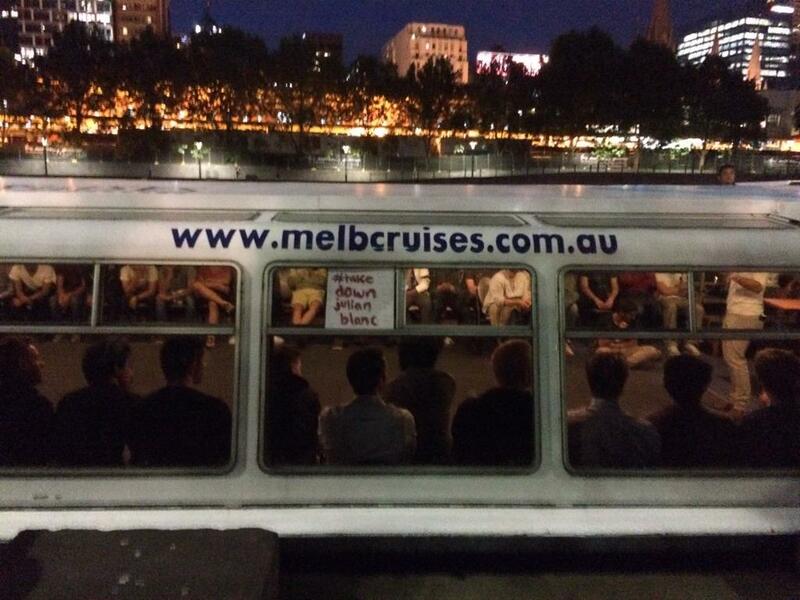 Damn fine job by all those in the streets and on the banks to #takedownjulienblanc. If I was Bob Hawke, you'd all have tomorrow off work. The #takedownjulienblanc hashtag tonight is a thing of beauty. The Bayview on the Park hotel also cancelled the booking Blanc made to stay there, writing on its Facebook page: "Bayview on the Park does not condone assault and abuse of women." UPDATE 1830AEST: Immigration Minister Scott Morrison intervened in the case and deported Julien Blanc. "This guy wasn't pushing forward political ideas, he was putting a view that was derogatory to women and that's just something that our values abhor in this country," Mr Morrison told Sky News. The case has broken new ground for authorities. We can confirm that Julien Blanc left Australia overnight. His assistant is also due to leave shortly. "Labelling women as objects and actively promoting the abuse of women degrades the dignity of our whole community," Victorian Police Commissioner Ken Lay wrote in a statement posted online. "We want to assure everyone that we have been paying close attention to this issue and appreciate that so many community members have expressed concern." BuzzFeed News has attempted to contact Real Social Dynamics and Julien Blanc.